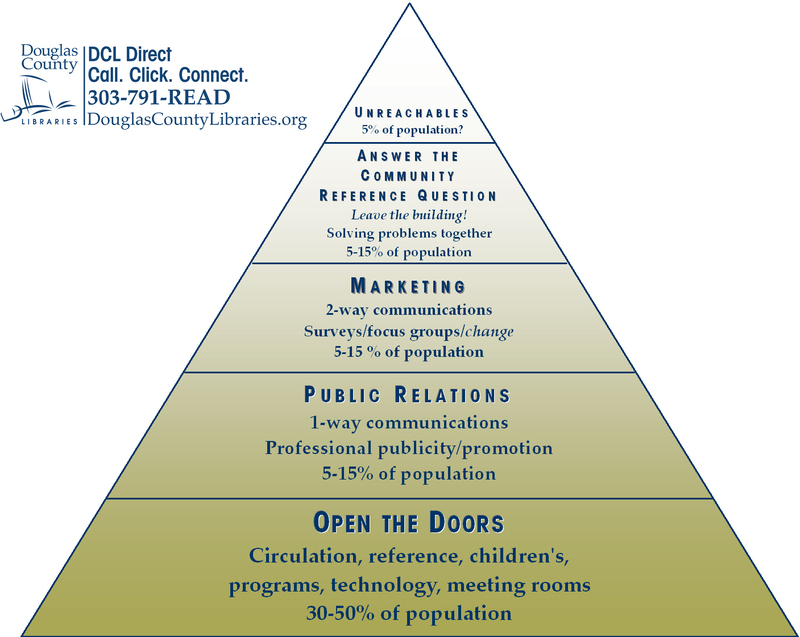 The next level is Public Relations, in which libraries get their branding act together, send out graphically consistent messages to their community about those core services. When patrons go through big life changes - pregnancy, birth, career change, major consumer purchases, illness, retirement - they discover the library message and connect. The outreach activity of PR is one way, and can garner another 5-15% of households. 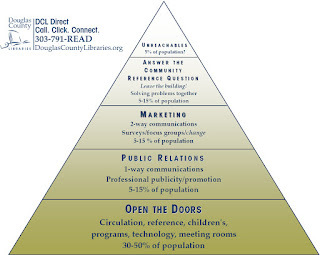 The next level is marketing, which focuses more on exploring the needs and interests of the community through various surveys, interviews, and demographic analysis (and so two-way), then developing appropriate library responses. This can gather another 5-15%. Next up is community reference: a focused outreach that answers questions that never would have been brought to the library, but affect the community at large. This strategic outreach to groups actually working on big community projects can gather another significant share of the population. Is it as high as 15%? I'm not sure. At the top is some percentage - I don't know what it really is, either - that simply isn't and won't be interested in the library. Those folks may enjoy other benefits, such as a more literate community, with higher median wealth and lower crime. But they doesn't know that and don't care. Anyhow I think I've had links in the past to this image at jlarue.com/pyramid.jpg. Now a search for jlarue.com and pyramid might get people to it.